This weekend my awesome cousins came for a visit (four days of madcap touristing!) and one was sporting a new tattoo. 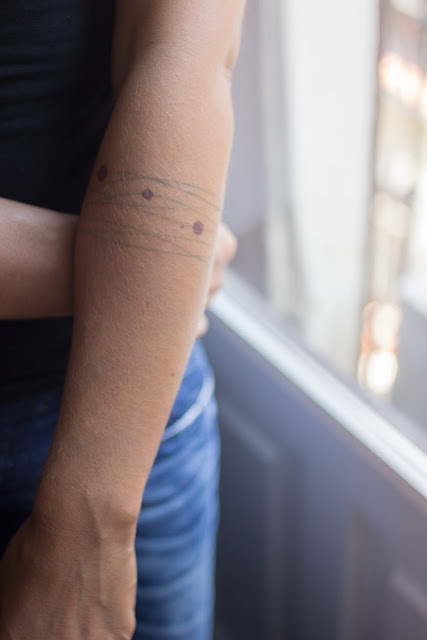 She now has 8 celestial bodies on their criss-crossing orbits (and a little beauty mark of her own that serves as a moon) making a beautiful cuff on her arm. I love how it manages to boldly take up so much real estate but still be so delicate and airy at the same time. She's a big astronomy buff as well so it's just the perfect thing for her. I don't have any tattoos, the closest I get are the temporary kind. But I do admire them from afar and even have a pinterest board dedicated to beautiful ink. I've always thought that I would happily get one, if only I could come up with something I wouldn't mind having forever. But it would have to be something that's a perfect fit like this one is for my cousin. Would you get a tattoo? Do you already have any ink? Did you give it a lot of thought or was it more impulsive? Same here, I don't have any tattoos myself but I do admire them on others. I have no clue what I would get if I were to get one though. I'm in the same boat - love tattoos, love them on other people, but I can't decide the "what" and "where" for myself. The thing is, I seem to have the cheesiest taste in ink! Whenever I think I have thought of something perfect it turns out to be gigantic trend/cliché a year later. Guuurl, we are glued to Project Runway every Saturday morning while we eat our breakfast. I love Helen AND her tattoos! Yes!! She is so damn cool, isn't she? Tattoo is always a difficult decision to make as it is so permanent, so there is the fear to change your mind in time or something. I really love the elegance of a simple tatto, and how each person decided to ink them, this is the epitome of a personal detail to me. So glad someone who actually has some ink chimed in! Your tattoo sounds really well thought out and beautiful (show us!). But even so, do you ever regret it? I think that's what those of us who are un-inked fear, the 'doh!' forhead slapping moment when you wonder why you thought that would be good forever. I do love the idea of a constellation, it's one of the ideas I've been toying with myself. I think there's an abstractness of image there that I'm attracted to, it'd be graphic without being literal. I've been contemplating a crescent moon as well! Kali, you are a seriously wise woman. I love the idea that tattoos don't have to be symbolic of ourselves over the whole span of one's life, but rather can be tied to a certain place, time, and era of one's life. If you embrace that rather than try and outwit that inevitability, it's true that a tattoo can be a wonderful reminder of who you have been and what you've been through, regardless of how you've evolved over the years. My brain just expanded a little bit. Thank you. Wowwww I love her tattoo. So delicate and powerful. I do have tattoos and am craving more! Yes, I think that's exactly it, it manages to be delicate and powerful at the same time! What sorts of tattoos do you have? Did you agonize over the decision or was it more of a whim? This really is my first-time i visit here. I discovered so many entertaining stuff in your blog, especially its discussion. From the a lot of comments on your articles, I suppose I am not the only one having all the leisure here! Maintain the superb work.